CHATHAM — Harold's Chicken Shack is one of Chicago's most iconic restaurant businesses, with 40 locations across the city. People have been coming for its fried chicken and famous sauces for more than 60 years. But its popularity has a flip side: At least seven restaurants calling themselves Harold's Chicken Shack don't have an agreement with the company to use its name, according to Kristen Pierce-Sherrod, president of Harold's Chicken Shack Corp.
One of those owners, she says, is James Denman, 43, who said when he bought the restaurant at 439 E. 79th St. this year from a previous owner, he assumed it had a license agreement already. "At least that's what I was told. Each Harold's Chicken has a store number, and mine is 57," said Denman, a Chatham resident. "I'm just the person who bought the business. Had I known the previous owner did not have a license agreement I would not have spent my money buying it." Denman said he spent a little over $30,000 to buy the restaurant, which is why he plans to raise money through online investors instead of using a traditional lender to open a second location next year. But before Denman can move forward on his expansion, Pierce-Sherrod, whose late father Harold Pierce founded Harold's Chicken in 1950, said Denman needs to first become affiliated. "I have never met the man but I know he is running a business without any agreement with us," said Pierce-Sherrod, whose children work at a corporate Harold's Chicken in Beverly. 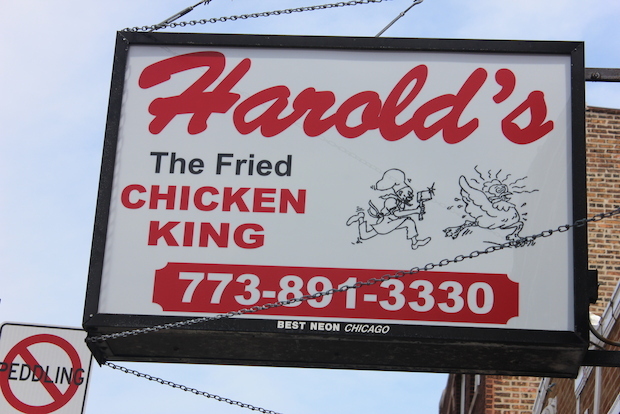 Most customers are unaware if a Harold's Chicken is affiliated or not, said Pierce-Sherrod. On Thursday when DNAinfo Chicago visited Denman's restaurant, state Rep. Elgie Sims (D-Chicago), whose ward includes the restaurant, was in line placing an order. The corporation is in the process of switching from license agreements with individual owners to franchises, Pierce-Sherrod said. "That process should be complete by the end of the year. Once we become a franchise business we will have more say over the restaurants," Pierce-Sherrod said. Denman said he is prepared to do whatever it takes to become an affiliated Harold's Chicken owner and plans to meet with Pierce-Sherrod to "get the ball rolling as soon as possible," he said. The restaurant has a business license in the name JMD Enterprises Inc. from City of Chicago to operate until June 2016. Melinda Kelly, executive director of the Chatham Business Association, said she plans to meet with Denman, who is not an association member, to see what assistance the association could lend. "We have resources available for our members to help them become successful and avoid situations like this one," Kelly said. "I plan to reach out to Mr. Denman to see what help he needs."